Constantine, the first Christian emperor, changed its name from Illiberis to Elne in honour of his mother Helena in the 4th Century. It was the seat of the Bishop of Roussillon from the 6th to the 17th centuries and to this day, the high town, on top of massive ramparts dominates the plain and the old routes to the Iberian Peninsular. Reached by cobbled, oleander lined alleys, is the huge Cathedral consecrated in 1069. 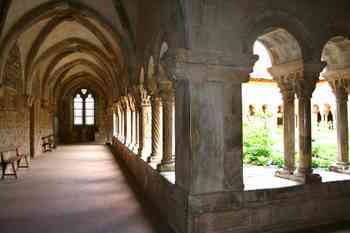 Its peaceful cloisters, made of the blue marble of Céret are amongst the most beautiful in France. Following the sculptural style of St Michel de Cuxa and Serrabonne, the garden they surround is full of traditional herbs and medicinal plants, just as it would have been in the Middle Ages. The cathedral itself, containing a fine Croix des Outrages, has a magnificent marble font and a stupendous view from its terrace. Take a guided visit or wander around alone between 9h30 and 17h30, avoiding 12h – 14h when it is closed for the usual French lunch hour..
Across the way, The Terrus Musée has a permanent exhibition of Etienne Terrus, contemporary of Matisse and Derrain, as well as interesting shows of artists with Elne connections. Well worth a visit. Walk the clearly signed circuit of the ramparts, or wander the flower filled alleys full of small galleries and workshops. Don’t miss Les Soufleurs de Verre , glass blowers of great talent and creativity, in their Aladdin’s cave of colourful glass works. Fascinating to watch, their highly original glass make ideal gifts. Pop into the Tourist Office for the programme of concerts and animations. 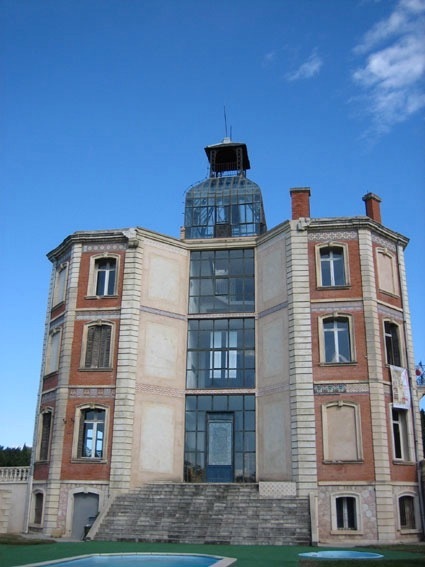 It is sometimes possible to visit the Maternite Suisse d’Elne, an inspiring and moving memorial to the young Swiss nurse, Elisabeth Eidenbenz, who, in 1939, opened the Château d’en Bardou and, with her team of young nurses rescued pregnant women from the internment camps of Argelès, Rivesaltes, Bacarès and St Cyprien thus saving the lives of almost 600 babies before being closed down by the Germans in 1944. As you leave Elne, direction Argelès, at 67 Av Paul Reig, the beautiful old cellars of Mas Reig, Les Vignerons d’Elne offer free tastings of their wide range of AOC Roussillon wines both red and white as well as their unique, naturally sweet AOC Rivesaltes. A combination of traditional methods and modern technology ensure high quality wines at a very reasonable price. The staff are knowledgeable and friendly. Their help and advice makes a visit to the cool cellars full of large wine barrels and racks of enticing, glowing bottles both enjoyable and informative. Continuing along the same road, just before the express way you can’t miss the large blue butterfly sign of Le Tropique de Papillon. Stop, and enter a butterfly paradise. As you wander through aviaries filled with exotic plants and tropical flowers, you will marvel at literally hundreds of ravishing butterflies from all over the world. A more relaxing and magical place would be hard to imagine. There is a caterpillar nursery, a children’s play area and a shop, but, above all, it is the murmuring of the fountains, the greenhouse garden of bananas, lotus and hibiscus and the magnificent colours of the softly fluttering butterflies that make the Tropique du Papillon a gentle oasis of peace and beauty to be enjoyed at your leisure. Open non stop June to the end of August,10h – 19h.